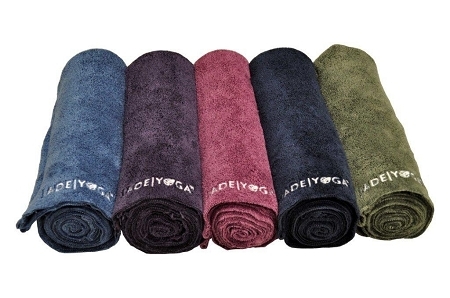 Jade microfiber yoga towels are made with polyester microfiber, weigh about 8 ounces and are super absorbent and quick drying, provide great grip - grabbing your yoga mat holding you too while you sweat, and soft and lightweight - easy to carry and silky smooth. Jade's Microfiber Yoga Towel is a great yoga accessory for hot yoga or any exercise practice where you sweat a lot like Pilates. Through its partnership with thewaterproject.org, Jade will provide one month's worth of clean drinking water for one person in the developing world for every towel sold. Jade Microfiber Yoga Towels are made in the US in compliance with all US environmental, labor and consumer protection laws. Towels are 24" x 72". Please wash before use to remove loose fibers.